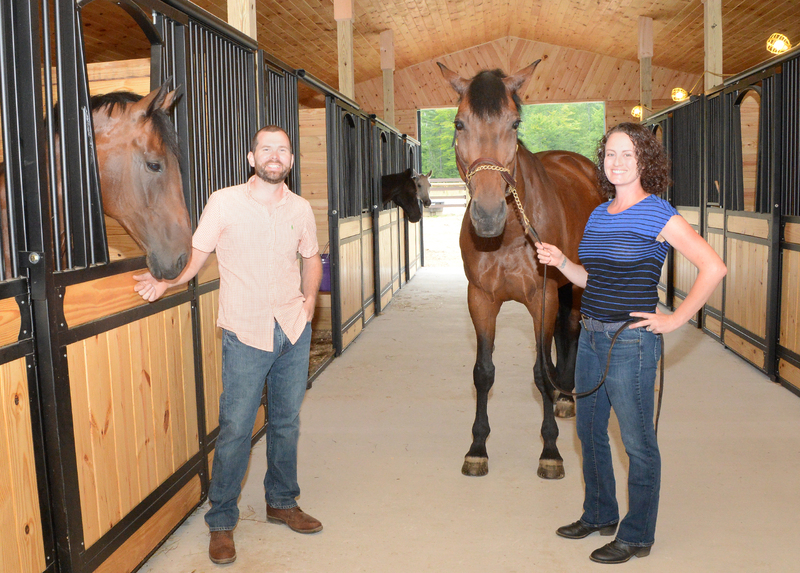 Mike and Stacey Isles will open a private boarding stable for horses this fall. A 12-stall private boarding stable for horses is being built in Greenfield. Mike and Stacey Isles, owners of what will be Graphite Hill Farm, hope to be accepting boarders by September or October. The Isles purchased the 100-acre parcel of land in Greenfield in 2016 and have cleared approximately 15-20 acres for paddocks and an outdoor arena. They plan to keep the remainder of the property natural and they will develop riding trails. Mike Isles is a farrier— a craftsman who trims and shoes horses’ hooves—and owner of MFI Farrier Services. Stacey Isles has owned horses her entire life. She grew up riding and training Appaloosas in the Binghamton area. “We spent more than two years looking for the right land, house and barn, but we never found all three together,” said Stacey Isles. When they found the Greenfield property, they were drawn to the way it was flat and sandy in front, with forests in the rear. Isles said that the flat, sandy soil is good for horses and the forests in back will make great riding trails. The barn was built by D&J Construction, based in St. Johnsville. “It’s grander and fancier than we ever expected. A lot of the detail and the wood working was all their idea. They are amazing woodworkers,” she said. In addition to the barn, Graphite Hill Farm has an outdoor arena and eight paddock areas for the horses. Once construction is complete, they will use seven of the 12 stalls for private boarding. The other five stalls will remain for their own horses. Their sixth horse is at Skidmore College, where he works with young riders who are learning how to become jumpers. All stalls are 12 by 12 feet. The Isles are marketing the stable as a private, quiet and peaceful place for people to board and spend time with their horses. It is also conveniently located on Coy Road in Greenfield, just 15 minutes from downtown Saratoga Springs. After working in the field of criminal justice research for nearly a decade, Stacey decided to make a career change and opened a pet-sitting business. She owns six horses, which she had been keeping at a local barn. The couple decided they wanted something more private for themselves and their horses. They are both experienced riders, with extensive knowledge of the care and training of horses. Mike Isles had another career as a critical care nurse before deciding to devote himself full-time to working with horses, starting his farrier business in 2013. He focuses on high-performance horses, with more than 250 equine clients. He also works closely with local veterinarians. Isles said she has put her pet-sitting business on hold while they were involved in the construction project, but she will most likely re-open it once all construction is finished and they have their boarding operation up and running. Horse owners looking for more information about Graphite Hill Farm can visit www.graphitehillfarm.com.